Art is in the eye of the beholder, even when it is made of waste and recycled plastic. 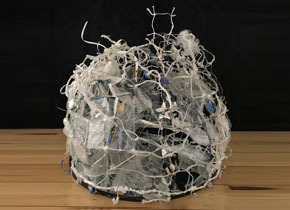 Artist Karen Preston has taken this to heart and collected all plastic waste generated by her household over 12 months for her new exhibition, Plasticity, which opens at the Switchback Gallery on 30 April. As the Gallery’s first exhibition of 2019, Plasticity addresses the current environmental issues of waste and recycling. Every piece of plastic was documented and used to create artworks. The pieces explore plastic waste as an art medium while questioning the implications of plastics amalgamating with our natural environment. First invented in 1907, plastic is now seemingly indispensable in everyday life. In just 11 decades it has become one of the most durable materials ever invented. A toxic and waste product, plastic has entered the food chain and is destroying marine and terrestrial environments. Globally countries are now recognising the urgent need to reduce, reuse and recycle plastic waste. The artworks in the exhibition consider plastic as a malleable material that is interwoven with existence physically and psychically. They play with the flow between myth, belief and reality, while engaging with concepts relating to gender identity, children’s toys and household objects. Plasticity will be on display from 30 April to 28 June at the Switchback Gallery on Federation University Australia’s Gippsland campus.